Maharaja Ranjit Singh was the first Punjabi to rule over the Punjab in the recorded history. His kingdom extended from Tibet to Sind and from Kabul to Sutlej. At least 80 percent of population of the territory he ruled over was Muslim, 10 percent were Hindus and the remaining percent were Sikhs. 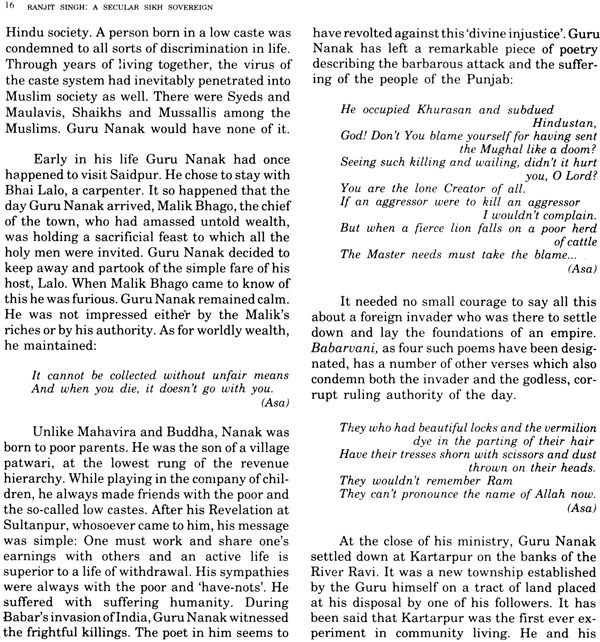 A devout follower of Guru Nanak, he never discriminated against and faith. Once he told his foreign minister Fakir Azizuddin, 'God intended my looking upon all religions with one eye, that is why I was deprived of the other eye.' 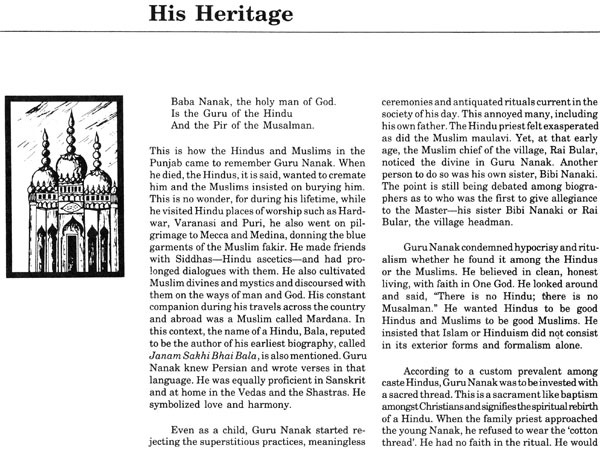 This is the story of a truly secular monarch told by a leading story teller in the country today at a time when the social fabrics under severe strains of religious fanaticism. There is no lack of historical literature on Maharaja Ranjit Singh, a commanding and arresting figure of nineteenth-century India. Several of his contemporaries, Indians as well as foreigners, have left detailed accounts of his achievements and personality. Many books were written in English about the Sikhs and the Punjab within a decade of the Maharaja's death. Several of the foreign visitors who had either served the Maharaja or visited him recorded their first-hand impressions. In this context, the names of Osborne, M'Gregor, Steinback, Murray, Carmichael Smyth, Thornton, Baron Hugel, H.M. Lawrence, Charles Masson, W. Barr and Cunningham are well known. 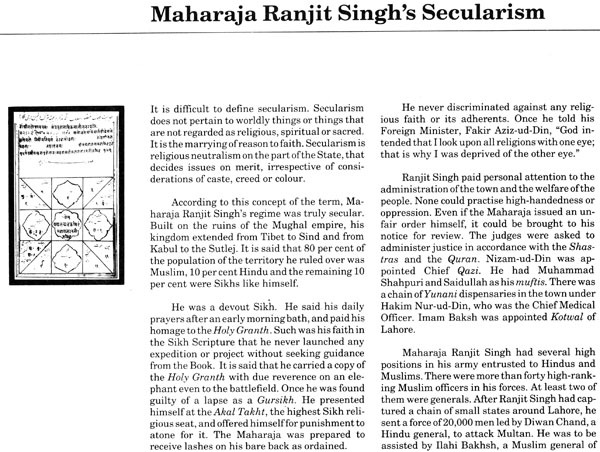 Henry Prinsep wrote his book about Ranjit Singh within his lifetime-in 1934. Over the years, books for the specialist as well as for the lay reader have been steadily arriving. 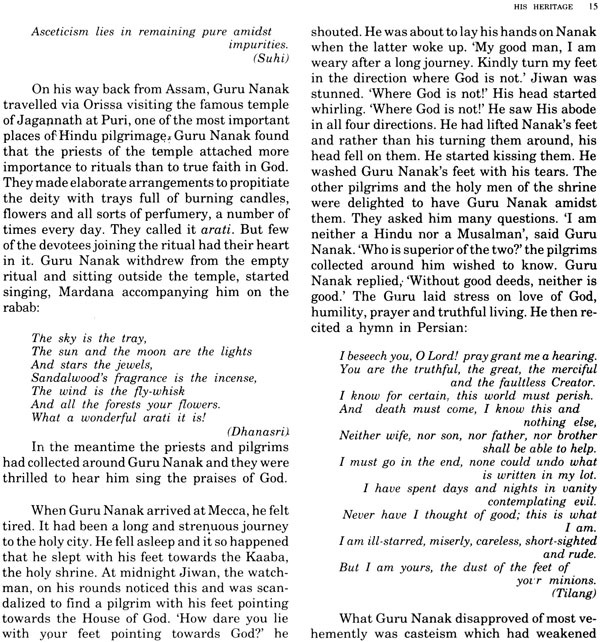 The bicentennial of the Maharaja's birth, especially, brought forth a considerable amount of literature. In history there is always scope for a fresh look on any subject. 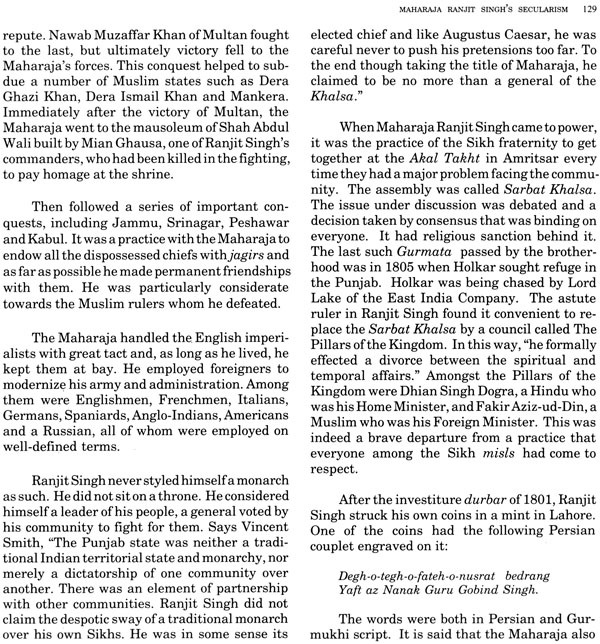 For this reason, this latest book on Maharaja Ranjit Singh from the pen of the noted Punjabi litterateur and creative writer K.S. Duggal is entirely welcome, and it does bring some fresh insights and perspectives to the theme. The author portrays the emergence of the phenomenon that Ranjit Singh was in its historical setting, tracing in detail the evolution of the Sikh commonwealth from the time of the Founder, Guru Nanak. 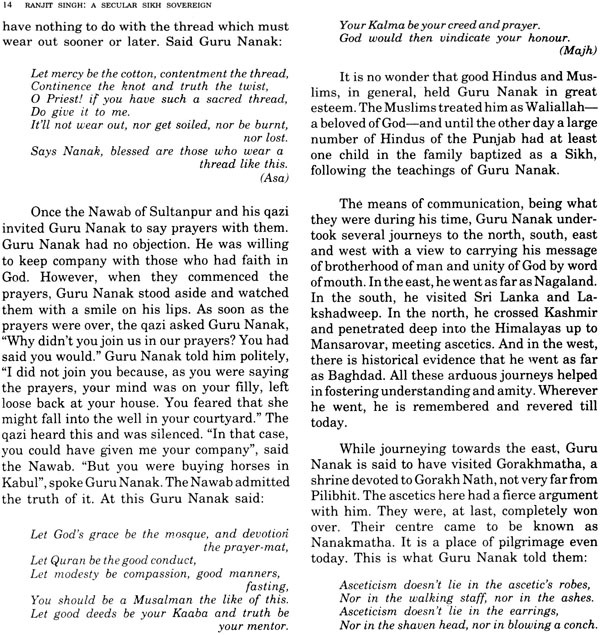 Under the Gurus, the basic Sikh tenets and institutions were established. 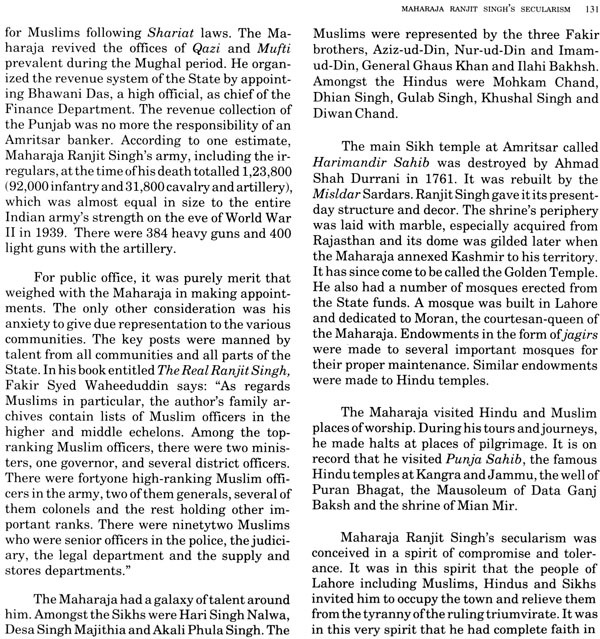 Under Banda Singh the Sikhs shook the mighty Mughal empire to its very foundations. After Banda Singh's death, with brief intervals of respite, the history of the Sikhs is a sustained record of their heroic struggle against the Mughals on the one hand and the Afghans on the other, resulting ultimately in the liberation of the Punjab which began with the establishment of the Misls, or Sikh independencies. The leadership was then assumed by Maharaja Ranjit Singh, the most outstanding product of the eighteenth-century political revolution in the Punjab, initiated by the Sikh resistance. His conquests and his feats on the battlefield as well as his creation of an efficient and humane system of administration are described in the book in vivid detail. 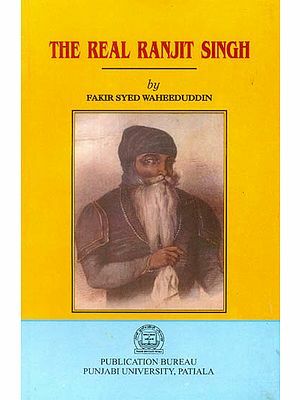 What has impressed the author most is the personality of Ranjit Singh who indeed was "no common character but possessed of powers of mind rarely met with either in the eastern or western world." He has, appropriately, highlighted his generosity of nature, his liberal outlook and his equal treatment of all-Hindus, Muslims and Sikhs. The other highlights of the book are the chapters on the arts and on literature in the Punjab under Maharaja Ranjit Singh. The present work is not a research study. It is more in the nature of a tribute to a great leader of men produced by the Punjab who liberated north-west India, establishing an authority in which all people, without distinction of creed, class or caste, were co-sharers. Misunderstandings still prevail about the Maharaja, his character and personality, his policy and administration, engendered mostly by some of the early European writers. K.S. Duggla's book corrects several of these faulty perspectives. Kartar Singh Duggal (b. 1917) is a leading Indian writer who writes with equal felicity in Punjabi, Urdu, Hindi and English. His books have won several coveted awards including Sahitya Academy Award, Ghalib Award, Soviet Land Nehru Award and Bharatiya Bhasha Parishad Award. Having served as Director, All India Radio, Director, National Book Trust, India, and Adviser, Planning Commission, he has now retired from government service and is currently Deputy Editor-in-Chief of Lotus, an organ of Afro-Asian Writers Association brought out in English, French and Arabic simultaneously.